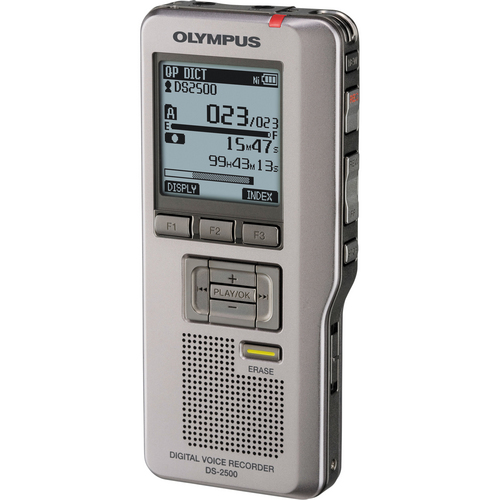 Whether you're recording lectures at school or meetings at work, the Olympus DS-2500 Digital Voice Recorder is a perfect choice for almost any professional or student who requires the benefits of a digital voice recorder and dictation device. You can record using the DS2 (DSS Pro) format, which saves files in high-compression DSS format using the included DSS Player software. 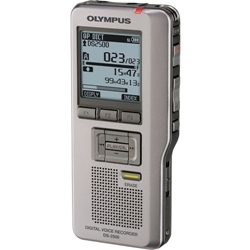 The recorder features push-button control, PC Link, voice activated recording and a backlit 1.74" LCD display. You can record in SP or QP modes, and you can easily switch between Conference and Dictation settings. The DS-2500 records directly to an SD card and it supports cards up to 32GB. Plus, it features an internal mono microphone, built-in speaker, microphone jack and headphone jack. There's a USB interface for data transfers and an erase button for quickly erasing single files or entire folders. The recorder runs on two AAA NiMH rechargeable or alkaline batteries, which afford up to 37 hours of recording or 35 hours of playback. For added flexibility, the DS-2500 is even compatible with Windows and Mac OS. Use with AltoEdge Transcription Foot Pedal Bundle for a complete Dictation & Transcription solution! Copyright © AltoEdge Pty Ltd. All rights reserved.